This is going to be a bit of a jumble. The whole Rolling Thunder Revue period has really played a bit of havoc on my one year per week system, not the least because the tour itself ran from October 30 to December 8, 1975, and then again from April 12 to May 25, 1976. In some ways it is two distinct tours supporting Desire, and in some ways it is all of a kind. Basically, I’ve just been a little bit overwhelmed by the immensity of the whole thing, and going away for five days in the middle of it didn’t help. Fortunately, we do not have to address Renaldo and Clara for another two weeks, because it wasn’t released until 1978, but that will bring us right back into this chaos. Since I’ve already dealt with Desire, I’m going to start with Larry Sloman. Let me start by saying that other than the autobiographical Chronicles volume 1, this is the best book that I have read so far this year about Dylan (caveat: I have only read one chapter of Sean Wilentz’s book, and I think it is going to be better in the end). Sloman was a music industry hanger-on, friend of Roger McGuinn and Rubin Carter who was fortunately placed to be around Dylan when the tour was just initially coming together. He then covered the tour for Rolling Stone for a few weeks. He wrote this article, and then another that was substantially rewritten by the editors. 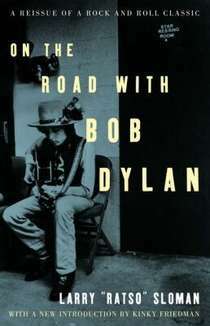 Dylan’s contempt for Rolling Stone is one of the themes of the book. Eventually Rolling Stone cut him off, but he continues on the tour as basically an employee, supporting the filming of Renaldo and Clara and interviewing people. The book is a diary for the most part. It’s not much about Dylan – you get very little sense of Dylan from the book – but it is about the chaos of the tour. The RTR employed seventy people, from musicians to technicians, and basically rolled into towns with only a few weeks notice and set up camp and ran shows in venues large and small. The sense of chaos that oozes from every page of Sloman’s book is both intoxicating and invigorating. Characters move in and out. Joan Baez is a somewhat minor character – she teasingly renames Sloman “Ratso”, a nickname from Midnight Cowboy that sticks with him to such a degree that Sloman stops writing the book in the first person at that point, and switches to third person. It’s a very effective moment. Joni Mitchell is more prominent, mostly because of a fight she and Sloman have about gender and songwriting. McGuinn isn’t much there, nor T-Bone Burnett, nor Ronee Blakley. Sara Dylan appears midway through and is an interesting figure, as is Dylan’s mother, Beattie. The whole thing is written in the Hunter Thompson gonzo style of paranoia, drugs and rock and roll. It’s exhausting just reading about this tour, where everyone got a cold that basically never went away but they also never seem to go to bed. Sloman seems to have had his tape recorder going at all times, so there are great interviews here with the supporting players, but never much with Dylan, with whom he has only occasional contact. One of the things that Sloman is great about is covering Dylan’s earliest interactions with some of the performers who were influenced by him and who come in the generation after him. He details Dylan’s first meetings with Patti Smith, and her hanging around the rehearsals before the tour began. He writes about Dylan and Lou Reed, and Reed’s disinterest in what they were trying to do. He writes about Bruce Springsteen’s first meeting with Dylan at a show in New York, and Springsteen being essentially dragged out of the backstage area: “He looked so fine at first but left looking just like a ghost”. The coverage of the filming is probably the most interesting part of the book, and makes it sound completely out of control. Sloman was regularly dispatched to find locations and extras, and then the crew would just never show up. They’d plan to shoot Joni Mitchell performing in the streets of Quebec, and then forget about it. They’d write things as they were shooting and between takes. Sam Shepard appears briefly, hired to bring some order to the script, but I’m not even sure if he stuck around. He’s at a party on page 419, but I don’t know if he had left and then come back or he’d been there all along. It’s possible that even Sloman didn’t know. Anyway, it’s a great book. It’s probably too long at 460 fairly dense pages, but I was riveted by it because this is the one tour in the history of popular music that I am most fascinated by. You can’t see that from Hard Rain, the official live album from this tour. Hard Rain was recorded mostly at the May 23, 1976 show at Fort Collins, Colorado (with some stuff taken from the May 16 show). Unfortunately, this was one of the worst shows on the tour. 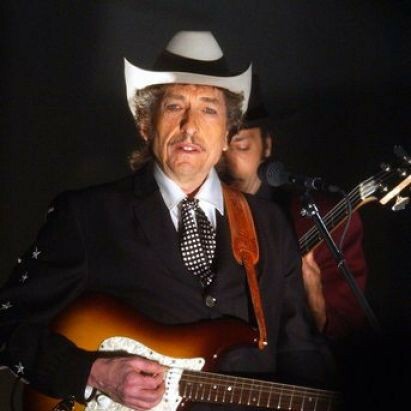 In Sloman’s book, he quotes Robbie Robertson (visiting the tour for the Hurricane Carter benefit show at Madison Square Garden that ended the first half) as saying about touring with Dylan: “It gets better. I don’t think it gets worse, I don’t think you lose it, I think it gets better”. That seems logical, but in the case of the RTR it is clearly not true. The live album came when the show had run out of gas. It’s not for nothing that everything on this album seems to be in slow motion. I’ve listened to a lot of bootlegs from this tour, and as late as the New Orleans shows three weeks before the end the shows are really good. By this point Sara was truly gone, and the love songs were replaced by things like “Idiot Wind”. Dylan was heading into his breakdown period (in 1977 there is virtually nothing at all to write about – he basically hides from the world again). The tour begins to slowly spiral out of control, losing its initial enthusiasm as it heads across the south and into Texas. If you listen to a lot of shows, you can definitely hear it petering out. Hard Rain was also a television special, but I was unable to get a copy of that. Someone put it on YouTube a few years ago, but Columbia has had it expunged. I don’t really want to see it, other than for the principle of the thing. 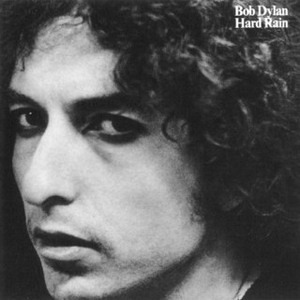 The other main problem with Hard Rain was that it was a single album. Unlike Before the Flood, which included songs by The Band and gave some sense of how the actual shows were, Hard Rain does none of that. Good-bye Joan, Roger, and everyone else. 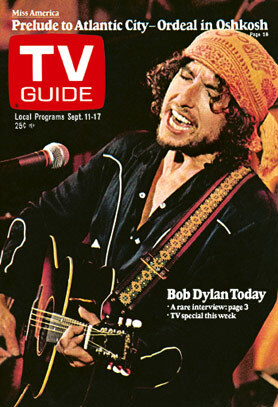 RTR was most assuredly not just a Dylan show, and Hard Rain does nothing to try to capture that. 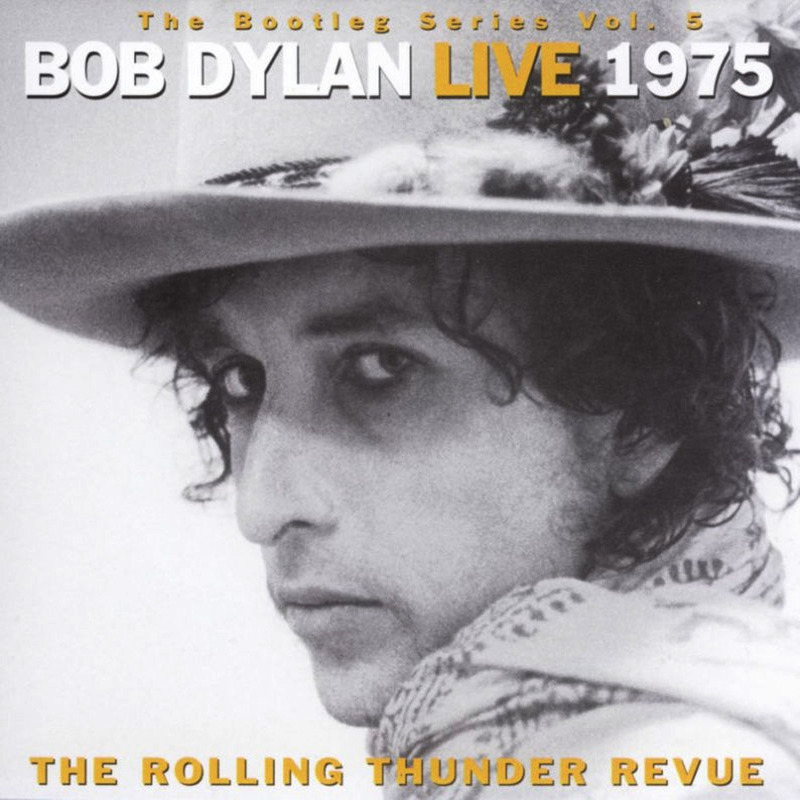 Much better is Bootleg Series 5, the live album that they should have done in the 1970s. Most of the material is taken from the shows in Boston, at Harvard, and in Montreal. Those are some truly great shows. Montreal might be my absolute favourite, and they could have done a great album just by releasing the whole show. Again, it doesn’t give the sense of a complete RTR show, but it does give much more vital performances than Hard Rain did. Though I’ve now reached the end of 1976, I am certain that this is the period that I will come back to again. I almost feel like next year I’d like to write a blog about this tour and try to listen to every show. Sadly, they don’t all exist. 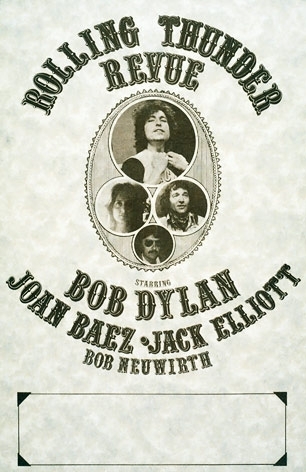 The bootleg of the tour’s stop at the Clinton Correctional Institute, where they played for Carter live, includes only three songs (“Blowin’ in the Wind”, “Hurricane”, and “Knockin’ on Heaven’s Door”) but Sloman argues that Dylan’s “Hattie Carroll” was the best version of it that he ever did – but it seems to be lost to history, alas. Also, the convicts booing Joni Mitchell off the stage. Also, Roberta Flack’s performance.